Keeping makeup brushes clean is so key to getting good skin, and a good makeup application. I'm a bit of an OCD/hygiene freak, so I love to keep my brushes nice and fresh. I've posted before about cleaning brushes here if you'd like to see some more tips. 1. Use rubbing alcohol to disinfect brushes. If you can get 90% alcohol or above, that is best, but I got 70% as that was cheapest on Amazon for a huge bottle! I decant this into a spray bottle and spray my brush handles with it to keep them free from bacteria. I think people often forget about the handles and just remember to clean the actual brush. 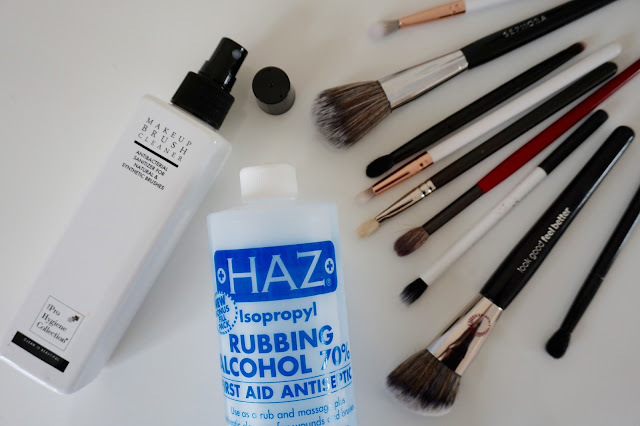 You can also use rubbing alcohol to spot clean brushes and to repair broken powder makeup, so it's pretty handy to have in your collection. 2. If you're an eyeshadow junkie, grab a spot cleaner. I'm always doing different eye looks, and with all the different colours, I go through brushes so quickly. I've been loving The Hygiene Collection brush cleaner to spritz onto brushes to spot clean them - and it dries so so quickly which is a definite bonus! 3. If your brushes are stained with colour, try a drop of olive oil to loosen the pigment on the brush. Just remember to rinse with soap afterwards to prevent your brushes from being too oily! 4. Try out a cleaning mat to get a fully deep clean. I love my small Real Techniques one, but I've seen lots of brands coming out with similar ones recently, plus there is the original Sigma one which is pricey but definitely the most thorough out there! Do you have any brush hygiene tips? Let me know in the comments! Next Beauty: First Impressions & Makeup Look! The Best Bargain Clay Mask!